Buying a condo in NYC is a much more straightforward process than buying a coop in NYC. It is important to keep in mind that buying a condo in NYC means you are purchasing real property versus shares of a corporation, which is the case if you are buying a coop in NYC. Because you are buying real property, the condo purchase process in NYC does not require any sort of board interview or board approval. This is very significant because once you are in contract on a condo, you effectively have a deal that should almost certainly close if your bank comes through on the financing. In sharp contrast, just because you are in contract on a coop does not mean you have a deal because you will then have to submit a purchase application to the board which needs to be approved. After your purchase application is approved, you’ll have to pass the dreaded board interview. If you haven’t done anything to offend the board and managed to pass the board interview and become fully approved by the board, only then will you effectively have a secure deal assuming your bank comes through on the loan. Over 98% of home buyers today begin their search online without a real estate agent because virtually all home listings will be available on popular real estate search websites. Gone are the days where only agents had access to property listings through their local Multiple Listing Service (i.e. MLS) inter-brokerage listings database. Public real estate search websites have become so good that many real estate agents openly admit to using them to search for listings on behalf of their clients. With the ease of use and functionality of today’s real estate search engines, you can easily save search criteria and get email reminders when new listings that fit you come on the market. They are so good in fact that many search websites allow you to search by custom, user drawn map boundaries so you can search for listings exactly where you want to live. Today’s real estate search websites have made the traditional buyers’ agent role of searching for listings obsolete. Since most buyers have already started searching by the time they choose a buyer’s agent, they often times will have already seen listing ideas sent to them by their agent. As the vast majority of buyers quickly come to realize, the real value of a buyer’s agent is not in sending the occasional email batch of stale listing ideas. The real value comes in the form of free personal advice and guidance throughout the process as well as the ability to legally split a portion of the commission earned to help cover the buyer’s closing costs. Remember that buyer agent services are free for home buyers. In NYC the seller pays a fixed commission regardless of whether you are represented or not. Therefore, the cost of your representation is included in your purchase price! If you decline your right to dedicated buyer representation, you’ll simply be handing the listing agent a double commission windfall under an awkward dual agency arrangement! A buyer’s broker commission rebate is therefore simply a more generous closing gift versus your typical bottle of wine or box of chocolates sheepishly presented by your buyer’s agent after close. With a broker commission rebate, you can cover the Mansion Tax through your buyer agent’s commission earned from representing you when you’re buying a condo in NYC. You could save $20,000 or more off your home purchase with a discreet commission rebate check presented to you at closing. Although condos generally have friendlier boards and more flexible sublet policies compared to NYC coops, there are always exceptions. 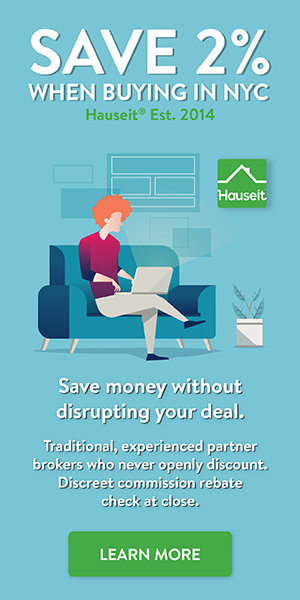 Having an experienced buyer’s agent (who also offers you a NYC broker commission rebate) can help you more intelligently navigate the market so you end up buying a condo whose board and policies are in alignment with your interests. Whether you are buying an apartment in NYC or buying a house in NYC, it’s important that you are aware of and plan for closing costs on your purchase. Closing costs for buyers in NYC are substantial and can add up to an extra 2 to 4% on top of your purchase price. Closing costs for buyers who purchase new construction units directly from a sponsor are even higher and can range from 5 to 6%. Buyers who a request a NYC broker commission rebate can effectively reduce their buyer closing costs by $20,000 or more. 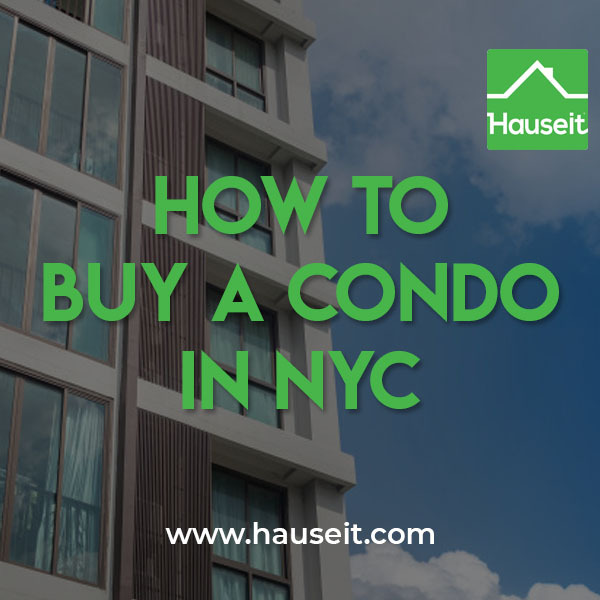 If you happen to buying a property above $1 million in NYC, you can effectively eliminate the NYC mansion tax by requesting a NYC buyer agent commission rebate from Hauseit. In fact, it’s conceivable that our partner brokers will cover all of your closing costs in some scenarios. For example if you are purchasing all cash without a mortgage (i.e. no Mortgage Recording Tax) a property under $1 million (i.e. no NYC Mansion Tax). In this case your next largest closing costs will likely be title insurance premiums and your attorney’s fee. All of this could potentially be fully covered by our partner broker’s commission rebate to you at close. Just because you’ve signed on with a buyer’s agent doesn’t mean you’ve lost your independence. Feel free to continue searching online and attending open houses on your own at your own convenience. At an open house, please remember to include your broker’s name on the sign-in sheet. Please email your buyer’s agent web links to any listings you want private viewings for and your agent will be happy to schedule them for you. Best of all, your agent will be here for you when you need advice and guidance throughout the purchase and closing process. The next step to buying a condo in NYC is to submit a credible offer to the listing agent of a property you wish to purchase. You can use this opportunity to consult with your buyer’s agent about bidding strategy and valuation. In order to receive a buyer’s agent commission rebate, your broker will need to submit the offer on your behalf. Doing so directly without your buyer’s agent will mean your buyer’s agent worked for free! Moreover, you won’t be able to receive a broker commission rebate if your buyer’s agent doesn’t get paid. The listing agent will want to see that you’re serious about purchasing this property. That means you’ll need more than just a one sentence email from your Yahoo! email account stating that you’d like to offer a certain dollar amount for the property. Assuming you’re lucky enough to have your offer or counter-offer accepted, you’ll need to make sure material terms of the deal are agreed upon before having a purchase contract sent out. That means agreeing on any contingencies the buyer needs such as a mortgage contingency, a sale or a Hubbard contingency, as well as details such as an expected closing date and any specific inclusions/exclusions (i.e. kitchen fixtures that the owner wants to keep). Once terms are agreed upon, the listing agent will circulate a transaction summary, commonly referred to as a deal sheet, to the lawyers and brokers representing both sides of the transaction. The deal sheet will also specify the commission that is split between the listing agent and the buyer’s agent. Unfortunately, most traditional buyers’ agents will never even share the deal sheet with their buyer clients. Why? Because they want the buyers to continue to perceive that their services are free. They don’t want buyers to know just how big a favor they’ve received from the home buyer! If you’re working with an agent who didn’t even mention that a deal sheet went out, chances are this agent hasn’t bothered to mention that he can share some of his commission with you through a 100% legal commission rebate at close. One of the most common NYC real estate agent lies our clients hear from agents is that they ‘have never heard of a commission rebate’ or say it’s ‘not legal’. After the deal sheet has been sent out and the lawyers representing both parties are in touch with each other, the seller’s attorney will send out the purchase contract to the buyer’s attorney for review. If a listing is particularly hot, the seller may require the buyer to sign the contract within a short time frame, often within a week. Your real estate lawyer will concurrently review the contract and conduct due diligence on your behalf. Due diligence will include an inspection of the building’s financial statements, board minutes and original offering plan. A good lawyer will also make sure there are no outstanding Department of Buildings violations that need to be rectified and that the building has a Certificate of Occupancy if it is relatively new. A diligent attorney will also compare the square footage listed in the original offering plan with what was publicly marketed by the listing agent online. Often times listing agents will overstate the size of the apartment which causes much angst once the buyer discovers the true size of the apartment. Overstatements of size typically range from 10-20%, especially for coop apartments but less common for condo units as square footage information is more readily accessible for condo apartments (i.e. NYC Department of Finance property tax bills which are publicly available). You may also order a home inspection at this stage if you’re concerned about an older unit that may not have its electrical, plumbing or wiring up to code. This is something you may want to consider as sellers in New York typically do not provide a seller disclosure form. In lieu of a seller disclosure form the buyer typically receives at $500 closing credit. You should use this closing credit to order a home inspection since the principle of caveat emptor (i.e. buyer beware) applies in New York! New York’s real estate legal code is particularly favorable towards sellers versus other states. Homes are sold as is, often without any sort of disclosure due to the $500 closing credit, and the buyers bear 100% of the burden of due diligence! Your attorney will review the contract with you and will negotiate with the seller’s attorney on your behalf if changes are needed. When contract terms are resolved and due diligence is completed, your attorney will typically meet you at his office to review everything before you sign. After you sign the contract, your attorney will mail or courier the signed contract along with a good faith deposit check (i.e. 10% of the contract price) made out by you to the seller’s attorney. Please note that nothing is final until the seller has counter-signed and fully executed the contract. Before that happens, the seller is free to go with another buyer even if you have signed the contract! If you are financing with a mortgage, your bank will require you to pay for a real estate appraisal. Your mortgage broker or banker will schedule this on your behalf once you feel like the deal is secure. This can happen before you have a fully executed contract if you are pretty certain that the seller won’t end up accepting another, higher offer. The appraised value is important because that is the value that your bank will be loaning against. For example, let’s assume the contract price is $1 million and you were also pre-approved for a $1 million purchase with a 20% down-payment. However, the appraised value comes out to be $800,000. That means the bank would then agree to only loan you 80% of $800,000 instead of $1 million. As a result, you would only be getting a $640,000 loan versus an $800,000 loan. You will have to put the shortfall in as additional equity! Fortunately, a good real estate attorney will try to negotiate certain contingencies to protect you in such a situation when you’re buying a condo in NYC. For example, an attorney may use a minimum loan amount contingency where the buyer can walk away with his deposit if the bank’s approved loan amount is less than a certain threshold. Read our guide on questions to ask your real estate attorney before you hire them. Make sure you’re working with someone who specializes in NYC real estate transactions! Did your appraisal come in with an acceptable value? Great, now continue to work with your mortgage banker to secure a mortgage commitment letter. Please note that a commitment letter from a bank does not obligate the bank to fund your loan. Read the fine print and you’ll notice several contingencies they’ve included which may preclude them from actually financing your deal. After you’ve received your commitment letter, you should push your mortgage banker to give you a “clear to close.” That basically is a sign-off from the bank saying they are ready to fund your loan. Once you have a clear to close from your bank, proceed to schedule the closing which will typically happen at the seller’s attorney’s offices. It’s important not to forget this step. You’ll want to inspect the property the day of closing or the day before closing to make sure nothing material has changed in the condition of the property since you last saw it. You will want to test the lights, faucets, air conditioning, showers, toilets and appliances to make sure nothing has happened since your last visit. If you notice scratches or marks that were not previously there, you may record these flaws and request the seller to address these issues post-closing. Congrats on making it this far! The closing meeting will typically take place at the seller’s attorney’s office and will include lawyers from both parties, both the buyers and sellers as well as the banks’ attorneys and a closing coordinator (i.e. representative from the title company) who will chaperone the process. Brokers are typically not expected to attend this long, often multi-hour meeting and if they do it is only for moral support. Brokers typically show up at some point to pick up their commission checks and sometimes they do not show up at all, preferring to pick up the check from the seller’s attorney at a later date. At the closing, you will be handed all of the home’s keys by the seller as well as a commission rebate check from your buyer’s agent if you were savvy enough to sign up for a broker commission rebate. Your buyer’s agent will discreetly hand you a check typically after everyone else has left the closing. There is no need to be loud about receiving a discount on the property. Why rub it in the face of the seller? If you’re lucky, your broker commission rebate check could more than cover all of your closing costs in NYC! It is entirely possible to actually get paid to buy a property if you purchase a home under $1 million (i.e. no Mansion Tax) and do not use a mortgage (i.e. no Mortgage Recording Tax). If that’s you, congratulations and what a closing gift to tell all your friends about! Want to learn more about the NYC real estate taxes you’ll have to face as a buyer, seller and owner? Read our comprehensive NYC Real Estate Taxes Guide before you buy a condo in NYC!